Recently a fellow blogger asked me about shin splits and pain when she walks. I’m not a physical therapist or doctor but my first thought was: old shoes. 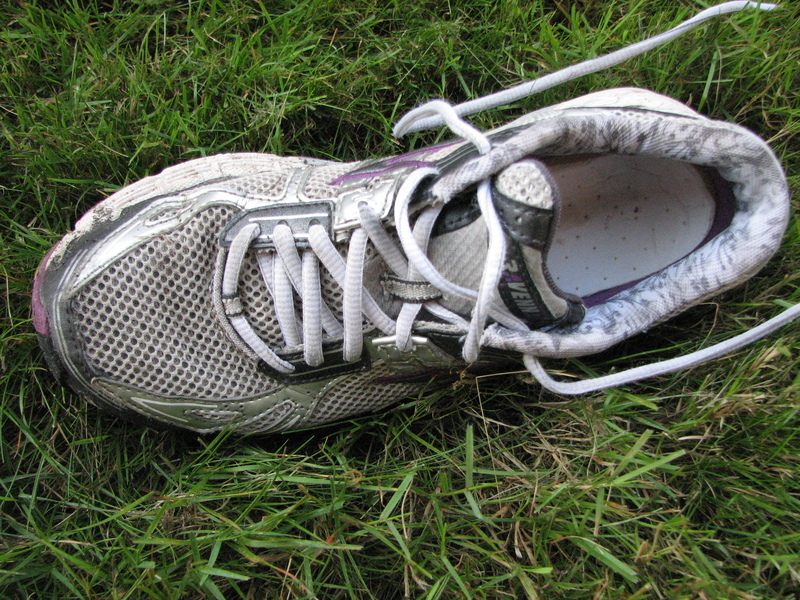 Running in old shoes can lead to running injuries (or overuse injuries). 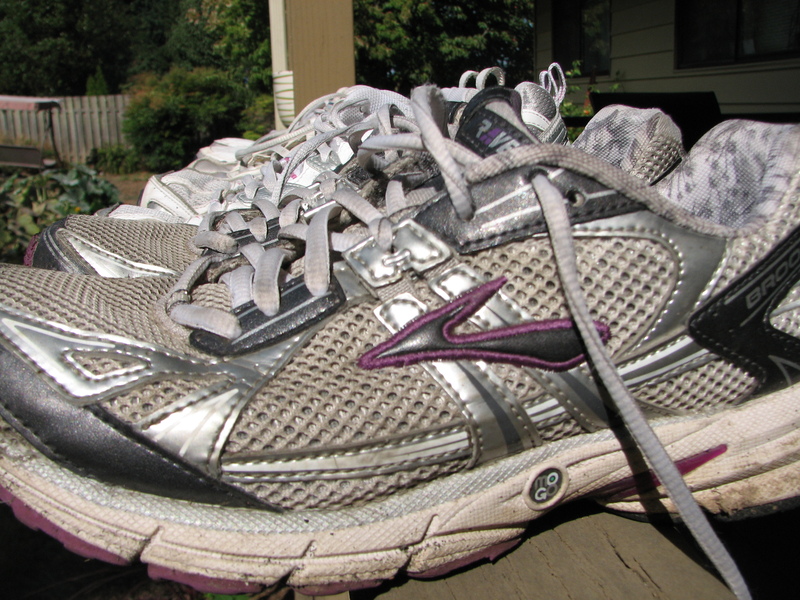 With time running shoes lose their stability and shock absorption isn’t the same as it was. When this happens the stress to the feet, ankles and legs can be dramatic. It might not be noticeable at first, but when the aches and pains become more frequent it’s time to look at the shoe’s quality. You can eye-ball the shoes to see if they are worn in weird ways. This wear and tear will depend on every individual runner and what their pronation/over-pronation tendencies are. The shoe’s mid-sole layer is what provides the cushioning and stability. This area usually wears out before the outer show shows major signs of wear. This is probably where you will feel it first. For me it feels less like I am running on clouds (like I do when I get a new pair of my Brooks Ravenna shoes) and it feels like I’m clunking along. Even if you aren’t a runner this same wear and tear that can cause injury can happen to you. 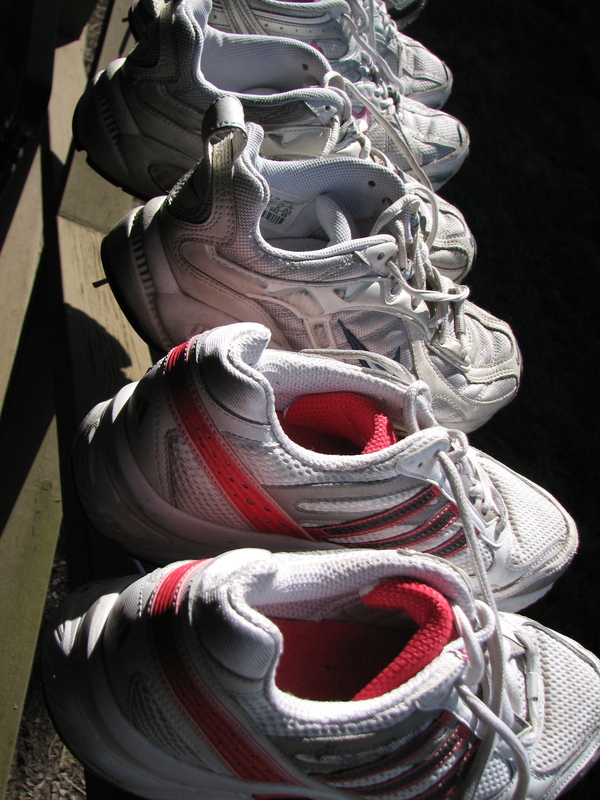 If you have shoes you walk in every day, or shoes that you wear when you go to the gym, they can cause the same pains. Another tip I’ve seen online is that people often have two pairs of shoes that they alternate wearing to slow down the wear and tear on the shoes. That’s a great idea if you can afford a second pair of new shoes. There’s no strict rule. Of all the running books, websites and forums I’ve read it seems like the general rule is every 300-500 miles. That rule is good if you keep track of your mileage. This equation is different for everyone. This will be much more frequent for people that run a lot, that are training for marathons. For someone like me, recovering from injury and taking it easy with the mileage, that could mean once or twice a year. Track your mileage. 300-550 miles later it’s time for a new pair. 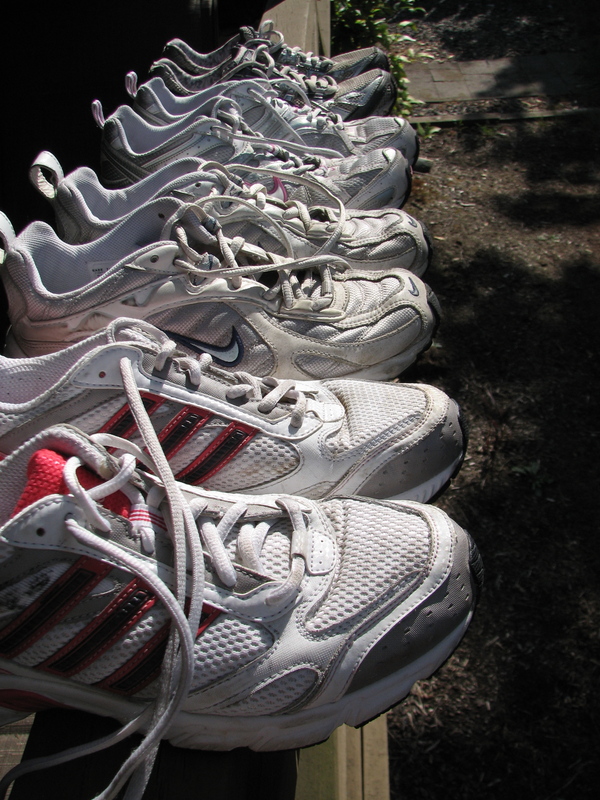 For distance runners (running 25 miles per week or more), replace your shoes every three to four months. If you aren’t really keeping track of mileage, or concerned with increasing mileage, then my recommendation is to go by how you feel. 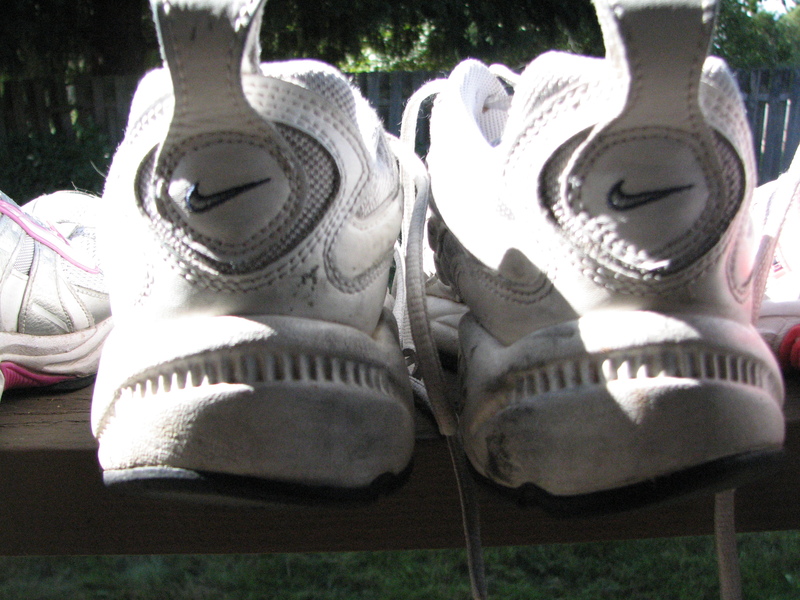 I can tell that my shoes are starting to wear down because when I do run I’ll feel lots of aches and pains. It usually shows up in my calves or hip joints. They start to ache with each step. Another sign to look out for is extra muscle fatigue, shin splints or new pains that you’ve never had before. Or you could just go by how they look. Do they look worn out? Do they have a funky smell? If you twist the shoe does it twist easily (new shoes shouldn’t)? Try this trick: check for signs of wear on the sole by placing your old shoes on a counter and stand behind them. If the soles are worn and leaning to one side, the midsole cushioning is probably worn out and could cause injury. Also–how has the weather been? Have you been running a lot in the rain? (Like us poor Northwest folks.) Then maybe those shoes need more frequent replacing. I replace my running shoes about twice a year. It used to be three times a year when I was running a lot (and training for Hood to Coast). I usually retire my old shoes when they start to look dingy and I’m feeling aches when I run. I buy new running shoes and my old pair turn into the shoes I wear to just walk around. When the old pair that I wear to walk around wear out I switch them out. I want to leave this important thought with you: good shoes are WORTH the money. 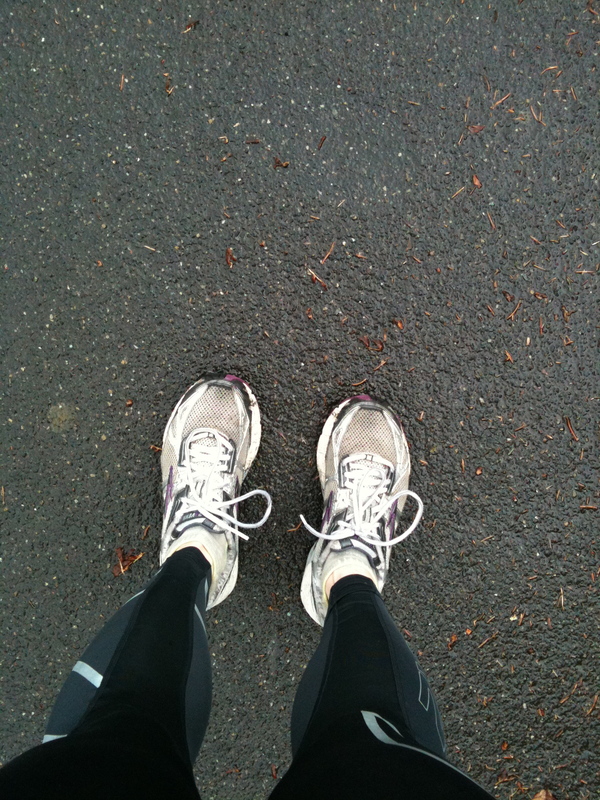 When I first started running I bought cheap shoes and replaced them frequently. I bought Nike shoes on clearance at the Nike Outlet. Sure they were okay shoes but they weren’t right for my feet or my gait. I waited too long to get a proper fitting at a running store. I am so glad I did it. Now I buy Brooks Ravenna shoes and they are worth the $100 price tag. They fit my feet, they don’t cause me injury and I love running in them. 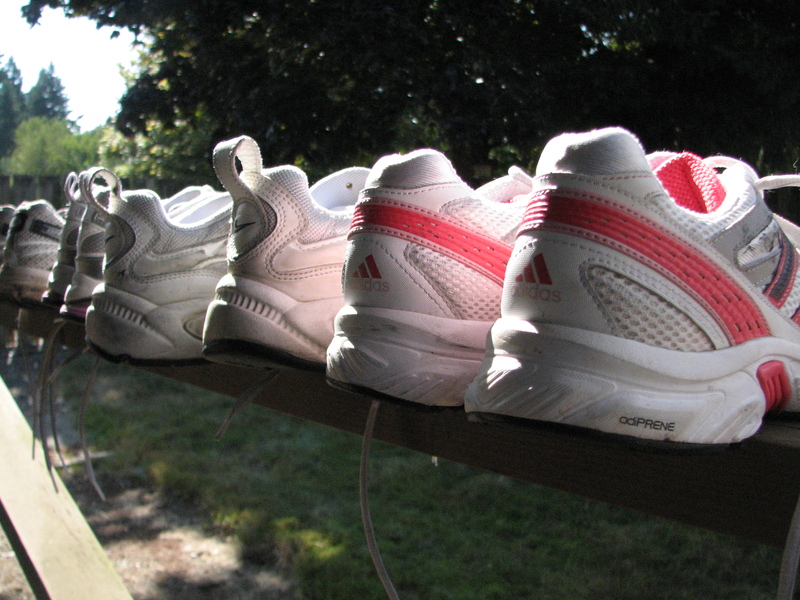 QUESTION: How often do you replace your shoes? How do you know when it’s time? I did find a new cheaper way of replacing. I got fitted for sneakers and they were the first pair I ABSOLUTELY loved. So I scoured amazon until they were on sale ($50/pair) and bought 2. It’ll be about 18 months of sneakers and then I’ll get refitted. I’ve also found that telling the sales person you don’t want to spend over $100 will mean they show you ones they think are just as good for less. I have also found my feet swell even more in the summer so I have to be careful with shoes that fit in March and then hurt in August. That my 2 cents. Great comment, Dina! It’s definitely different for everyone. I find that I often wear out the insides of my shoes before the outside of them. Buying shoes online is also a great way to save some money. I got fitted at a running store here in Portland (for free) and bought my first pair of shoes there. Then I got a gift card for another running store for Christmas and got another pair of the same shoes. Since then I’ve bought a new pair online when Brooks was offering a clearance sale on my shoes. I wish that I had bought two pairs at the time, but I couldn’t afford it. Next time! I replace mine 2 times a year. I am really, really hard on my shoes (and socks). I’m hard on my shoes too. I think I replace them 2x a year but last year I did 3x a year because I was running a lot more. Thanks for the link! I have a bag of shoes to donate. Such a timely post. I don’t run, but was at the gym thinking I need to buy new shoes. I guess it’s time to bite the bullet, pay a bit more and get some that feel good. Hope you have a great day!